Eric Karros is an American former professional baseball player who played in the Major League Baseball (MLB). Eric Peter Karros played for teams like the Los Angeles Dodgers, Chicago Cubs, and Oakland Athletics from 1991 to 2004. Currently, he works as a color commentator for baseball on Fox. As a color commentator, Eric Peter Karros reportedly earns around $75,000 as his yearly salary from Fox. Further, Eric Peter Karros has an estimated net worth of over $49 million. As of 2019, Eric Peter Karros has an estimated net worth of over $49 million. Further, he has an average salary of $75,000 dollars annually, as a color commentator for baseball on Fox. He signed a three-year contract worth $6.15 million in 1994 with the annual average salary of about $2.05 million. He earned $650,000 in 1994, $2.35 million in 1995 and $3.15 million in 1996. He signed a contract extension worth $20 million for four years in 1997 that would earn him the average salary of $5 million. The contract included $2 million signing bonus, $4 million in each of the next two seasons and $5 million in each of the last two seasons of the contract. Eric Karros is married to his wife, Trish Maly. The duo tied the knot in 1998. Together, they have three children named Mikah Maly-Karros, Jared Karros and Kyle Karros. Mikah acquired a master’s degree in clinical psychology from Pepperdine University. Eric Karros hasn't revealed much information about his personal life. He is currently in his fifties and still has a great relationship with his wife without any external affairs. Eric Peter Karros was not only a world-class athlete but also has a very attractive individual. The former baseball player is 6 feet 4 inches in height and weighs around 92 kg. Eric Peter Karros was born on November 4, 1967, in Hackensack, New Jersey. As per his nationality, he is American and belongs to the White ethnic group. Further, his star sign is Scorpio. Eric Peter Karros attended Patrick Henry High School in San Diego, California where he played for his high school baseball team. After completing high school, Eric Peter Karros enrolled at UCLA and played for the UCLA Bruins baseball team. 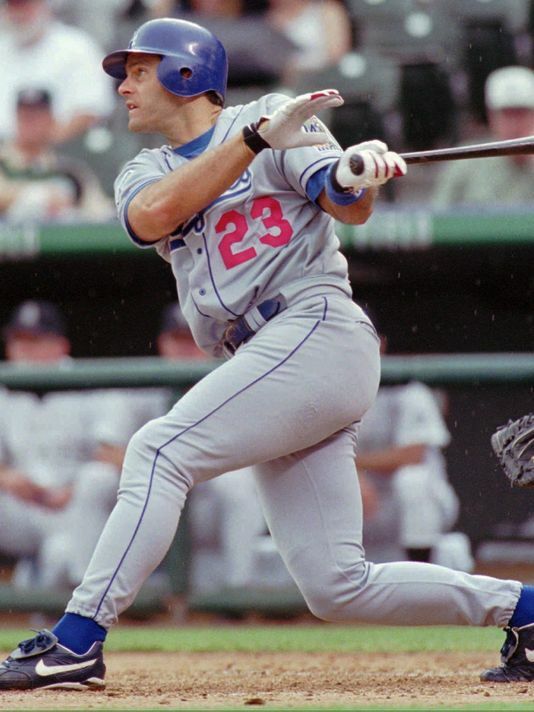 Eric Karros was selected by the Los Angeles Dodgers in the sixth round of the 1988 Major League Baseball draft. He made his Major League debut on September 1, 1991, against the Chicago Cubs. He became a full-time starter for the Dodgers in 1992 season, appearing in 149 games and hitting 20 home runs while driving in 88 runs and eventually was named the 1992 National League Rookie of the Year. On December 2, 2002, Karros was traded to the Chicago Cubs and started the season as the Cubs backup first basemen. In 114 games that he played with the Cubs, he hit .286 with 12 home runs and 40 RBI. He later signed with the Oakland Athletics before the start of the 2004 season. Karros’ last MLB game was on July 21, 2004, and was released by the Athletics on August 3, 2004. He appeared in a total of 40 games with the team, hitting .194 with 2 home runs and 11 RBI. Karros works as a color commentator for baseball on Fox and previously worked for Fox Sports in 2004. He previously worked on KCAL-TV in Los Angeles. He was also hired to call regional games for Fox Saturday Baseball in 2007.